Say the name "Yoshitaka Amano" to a longtime Final Fantasy fan and they may well go all weird behind the eyes, before telling you how much better the games were when he was designing things. I don't know about that - the current "buckles on EVERYTHING" aesthetic has its fans as well - but there's no debating just how damn pretty Amano's concept art for the series has been over the years. Once in charge of character design and illustration for Final Fantasy games, over the past decade Amano has relinquished that role, stepping back slightly and confining himself to logo design and promotional artwork. So the next time you see one of the series' fancy, swirling logos, you know where it came from. 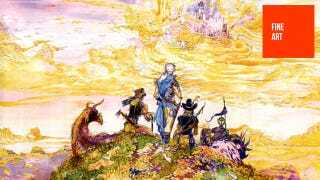 Amano isn't just a legend for Final Fantasy fans, either; he's done a ton of great work elsewhere, from comics (Sandman: The Dream Hunters) to animation (he was a character designer on Gatchaman / Battle of the Planets). The images below are mostly from Final Fantasy I-IX, though you can see a few examples of his later promotional and logo work as well.